Our interior digital load scales are our most versatile gauges. This scale can come with up to four air inputs that can monitor up to four separate axle groups or a combination of axle groups where some axle groups are monitored by two height control valves. With just one gauge mounted in the cab, you can monitor several axle group combinations on almost any dedicated truck and trailer set by using a quick disconnect air-line between each vehicle. For a truck and trailer set that has one height control valve on the drive axles and one height control valve on the trailer axles, use a gauge with two air inputs. For a truck and trailer set that has two height control valves on the drive axles and one height control valve on the trailer, use a gauge with three air inputs. For a dedicated B-Train that has two height control valves on the drive axle and one height control valve on each of the trailer axle groups, use a gauge with 4 air inputs. 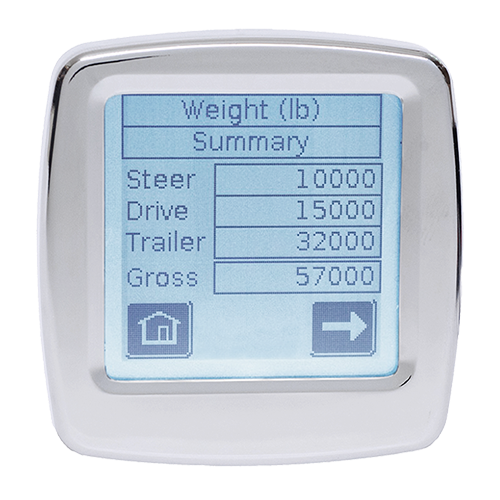 The estimated steer feature and weight values for the entire truck and trailer set can also be displayed. Extra features include a PIN lock out code, multiple language selection, easy to use touch screen, and adjustable back light.